An active and involved citizenry is vital to DBPD's success and there are several ways residents can get more involved with our operations. The Daytona Beach Police Department is currently looking for a few good men and women to add to its long-standing Citizens on Patrol program (COP), the department’s volunteer corps. Participants in the program are known as COPs and they serve in a variety of roles including traffic control at vehicle accidents, neighborhood patrols, fingerprinting, house checks for residents who are out of town, plus crowd and traffic control for special events such as Bike Week, Speed Weeks, art festivals and a variety of community events. Many times COPs act as ambassadors for our department. No law enforcement experience is necessary and participants receive appropriate training from staff and also on-the-job training from our veteran COPs. Uniforms are provided and COPs travel in specially marked vehicles. COPs do not carry weapons and have no law enforcement authority. Applicants undergo a criminal history and a driver’s license background check. 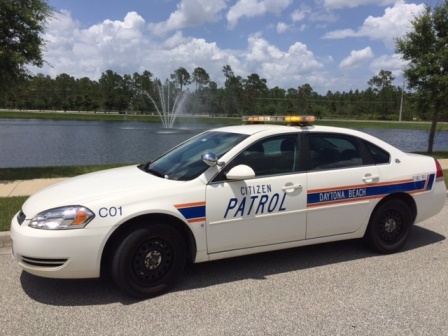 If you are interested in our Citizens on Patrol program and would like to assist in the safety and security of our community, please contact our COP office at (386) 671-5451 .